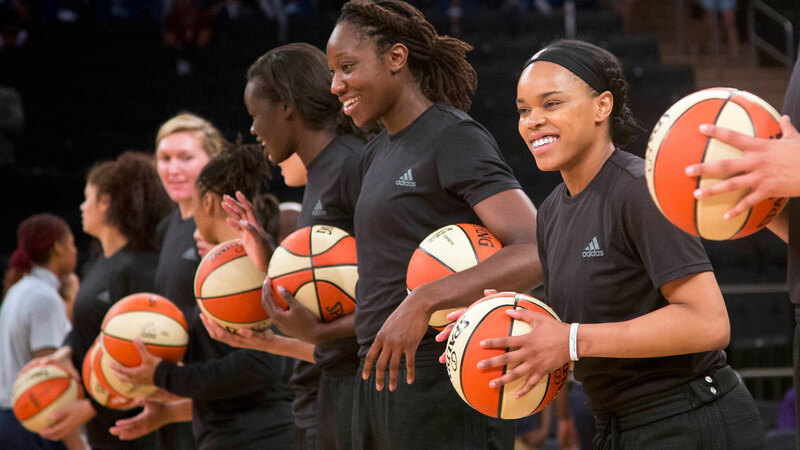 NEW YORK CITY -- The WNBA is withdrawing its fines for teams and players that showed support of citizens and police involved in recent shootings by wearing black warmup shirts before games. WNBA President Lisa Borders said in a statement Saturday the league was rescinding penalties given to the Indiana Fever, New York Liberty, Phoenix Mercury and their players for wearing the shirts during pregame protests, which began after shootings in Minnesota and Baton Rouge, Louisiana. Each team was fined $5,000 and players were each given a $500 penalty because WNBA rules stated that uniforms may not be altered in any way. The normal fine for uniform violations is $200. "While we expect players to comply with league rules and uniform guidelines, we also understand their desire to use their platform to address important societal issues," Borders said. "Given that the league will now be suspending play until Aug. 26 for the Olympics, we plan to use this time to work with our players and their union on ways for the players to make their views known to their fans and the public." The fines seemed to galvanize the players, who have used postgame interview sessions and social media to voice their displeasure. There has also been public criticism of the fines, including from NBA star Carmelo Anthony. The Rev. Al Sharpton said early Saturday his organization, the National Action Network, would pay the $500 fines. He called the penalty "unacceptable." The Liberty wore the plain black shirts four times, including Wednesday against Washington. Indiana and Phoenix donned the shirts on Tuesday night before their nationally televised game. The fines were administered Wednesday and neither the Fever nor Liberty wore the shirts at their matinee game on Thursday. Tina Charles did wear her warmup shirt inside-out in honor of a shooting in Florida that morning. "We commend Lisa Borders for recognizing how the players of the WNBA felt and the sensitive time that we're living in and being willing to re-evaluate their decision," New York Liberty President Isiah Thomas said. "We are also very proud of our players the world is seeing what we already knew. They're truly incredible, thoughtful and talented individuals. Our league, our partners and our society are better because of our players' willingness to enter the political and social activism arena." WNBA teams abided by the uniform rule on Friday - the last day of games before the monthlong Olympic break. Washington Mystics players had shirts saying "Black Lives Matters" in the locker room after their game Friday night. Seattle Storm and Minnesota Lynx players tweeted out pictures of their teams wearing black shirts featuring a Martin Luther King Jr. quote before their game. They didn't wear those shirts on the court to avoid getting fined.